I don’t know if you have noticed this but this year it seems like the Christmas season started way before Advent. As a matter of fact back in October I was meeting with my Tuesday morning men’s group when one of the guys pointed out that we were drinking from a Christmas cup. I took a look at the message written in the side and have admit that it caused a big impression on me. Now… I do not think it is proper for me to mention the name of this fine establishment were we meet every Tuesday. But, what I can do is show you the cup I’m talking about. 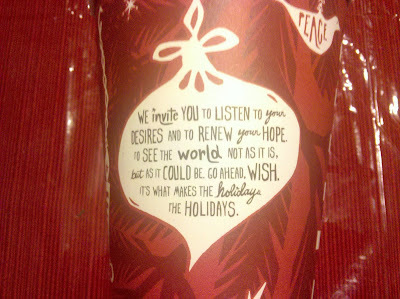 Like I said before, the message in this cup surprised me, not because I found some deep theological insight on it, but because I saw it as the complete opposite of the Advent message. Let me show you what I mean. 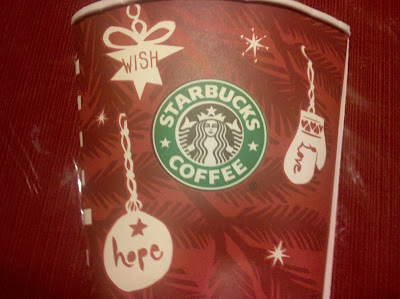 Right here around the seal we see the images of three Christmas ornaments with the words “Love” “Hope” and “Wish”. Perhaps it is because I’m a deacon but I’m always noticing stuff like this. When I saw this, my mind went to another very similar list of words “Hope”, “Love” and “Faith”; Which if you remember your catechism happen to be what the Church calls the 3 theological virtues. Before we can continue I need to say a few things about the word virtue because this is one of those words we do not hear every often in our everyday life. A virtue is a character trait which is valued as been good. The Church teaches that a virtuous person has a firm disposition to do good. Now if you go back to your religious education days again, you will remember that there are two types of virtues, human virtues (like fairness, wisdom, endurance) which we learn from our environment, family and friends. And then there is the other kind of virtue, a type so fundamental to whom we are that they cannot be learned. The only way we can acquire these is as the result of divine action. These virtues are a gift from God, given to us freely with the exclusive purpose of helping us fulfill our eternal destiny which is the salvation of our souls. There are only three virtues of this type, faith, hope and love. There is nothing we can do to earn or deserve these; however like any other virtue what we can do is ignore them when we find ourselves in a situation in which we are require to use these. At any moment in our lives we can exercise our free will and decide that we do not want to love, or to have hope or worst of all we can decide to ignore the dictates of our faith. You might be asking, ok…so…what about the cup? Well, when we see that “Faith” is replaced by “Wish”, the message is clear, in our culture we do not need faith; Yes, we should keep hope alive and love each other, but in this time before Christmas we should concentrate in wishing and wanting for those things that we would like to have. So at the end of the day what we are asked to do is, not to exercise a virtue but to enjoy a vice, vise we call “greed”. You might be thinking that perhaps I’m reading too much in just a cup of coffee. And maybe you are right but before you dismiss what I’m saying let me read to you what it says on the other side of the cup. Well… I do not know you but to me what makes the holydays the holydays is my belief that our Lord Jesus will return again in glory, along with the hope that he will take all of us with Him to heaven, and specially the holydays are the holydays because of the love I give to others and not because of anything I can wish for myself. Our faith tells us that this is a season for, loving and “waiting in joyful hope for the coming of our savior Jesus Christ” and not the season to sit down and contemplate the world as “it could be”. Advent is the season to become the “John the Baptizers” of our times. A time to go out and become the voice crying into the desert of our culture, prepare the way of the Lord, Jesus will come again, hope in his promises of salvation and have faith in His word and His Church. Faith, hope and love; this is the time to exercise these gifts from God, this is what makes advent so special. Have a most blessed and happy advent!